The property dates from the 18th century during the "Kingdom of the Two Sicilies" is owned by the same family since 1830, the new country home which originally had only one storey, has undergone many changes it has been carefully restored throughout in the last decade. Verdetecnica is conveniently located 1 Km. out of town on the top of a small hight with a splendid view over the countryside. The site is in fact a panoramic terrace overlooking a wide range of mountains on one side and the sea coast on the other side. It is the perfect way to have total access to the city whilst still being able to escape in an oasis of green tranquillity.The accommodation have easy access by car and is served by urban bus service. Verdetecnica offers 6 totally furnished apartments with well equipped kitchen and private bathroom, ranging in size from one to three bedrooms. 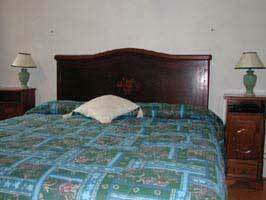 The apartments are of the highest standards with all conveniences, furnished with many authentic and original pieces, fully heated, air conditioning, Hi.Fi, Cd players & sat. TV. They all have separate entrances and private outdoor eating areas. Each apartment is fully equipped for comfortable self catering, an excellent calibre of housekeeping (including linen, towels and blankets) is provided. Complimentary "Welcome hamper" on arrival. basket with (olive oil, wine,fruits, tea,coffee, jam, honey,sugar,vinegar,salt,mineral water, orange juice, butter, cheese, brioches and bread). 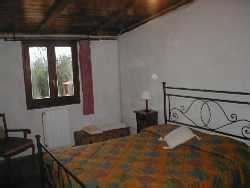 At no extra cost, free parking, mountain bikes,iron and board, and washing machine. Internet access, children playground, board games, books & toys. The common garden is made out of our green house, palms, cacti, olive and citrus trees and many Mediterranean flowering shrubs. 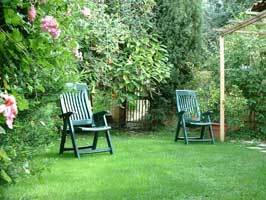 We are landscape gardeners and we are resident in the premises. (my husband, Italian, myself French and our two children). A relaxing shady area is equipped with barbecue and a dining corner (chairs, tables, hammocks and fountain ). 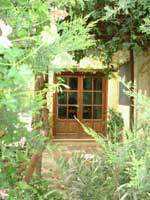 The property is gate-accessed, so privacy is assured. Set on the edge of the Mediterranean Sea, Sciacca Terme is an ancient and peaceful town with its thermal baths and fishing port. 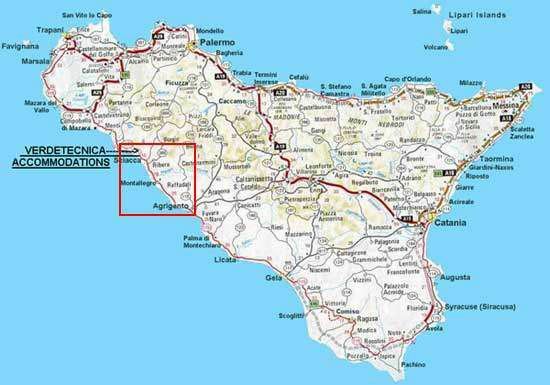 Furnished to very high standards, our quality self catering accommodation is situated on the hill of Sciacca, at only eight hundred meters from our town. All the apartments are bright and airy. 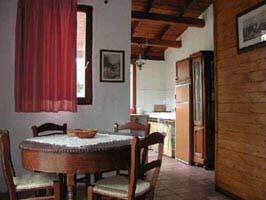 They were recently converted from a large old Sicilian farmhouse into self catering apartments. 55 sq. Mt. ca. 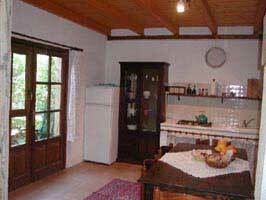 Consists in a living room + kitchen (4 burner stove, fridge/freezer, microwave, toaster) downstairs. Bathroom with tub, also downstairs. 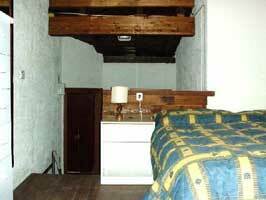 Upstairs: loft with a single bed and a large double bedroom (queen bed). Private enclosed terrace - 20 sq. Mt ca. with patio furniture. I can e-mail you pictures of this apartment, which looks a lot like the other ones (beamed ceiling, wooden furniture. etc.) if you wish. TV (Italian). Hi-fi with CD player. "Monika" is a 50 sq. mt. 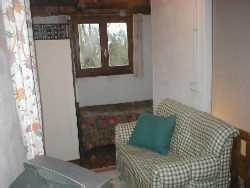 multilevel apartment (beamed ceiling and floor board upstairs), with a large and fully fitted kitchen furnished with antique wooden furniture (a wood burning stove), a small lounge with a divan size sofa bed downstairs, and under the roof, a loft with a single bed, opening to a large air conditioned master bedroom, bathroom (shower). Fully heated. The 60 sq. mt. 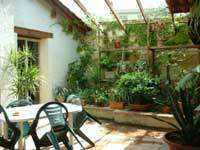 garden is for exclusive use of guests and comes with patio furniture. 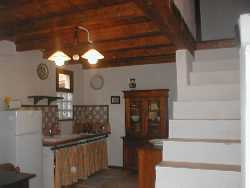 "Praga" (beamed ceiling, floor board upstairs) is also multilevel, 40 sq. mt., with one master bedroom upstairs, a fully fitted kitchen + large lounge downstairs, furnished with antique wooden furniture available as extra bedroom with one or two single beds (or double bed, according to your needs), bathroom with shower. Fully heated. A private sheltered terrace 20 sq. mt. for exclusive use of the guests comes with patio furniture. These two units ("Monika" and "Praga") are next door, with the same main entrance (A porch opening towards a lobby leading to the doors of each apartment). "Arianna" (beamed ceiling, 40 sq. mt) 1st floor, access from the alley. Consists in one master bedroom, one bedroom with bunk beds, an air conditioned and fully fitted kitchen/lounge furnished with antique wooden furniture, bathroom (shower). Fully heated. A sheltered terrace (9 sq. mt.) for exclusive use of guests comes with patio furniture. Ideally situated for visiting the Greek temples of Agrigento, Selinunte and Segesta. 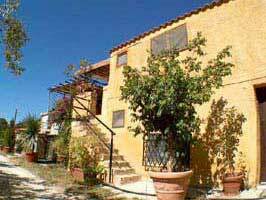 "Angelika", garden style apartment (beamed ceiling roughly 70 sq. 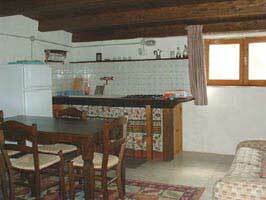 m) with two double bedrooms, one of which opening on a side room with 2 single beds; a lounge furnished with antique wooden furniture, fully fitted kitchen, bathroom (shower). Fully heated. Large sheltered patio (35 sq. 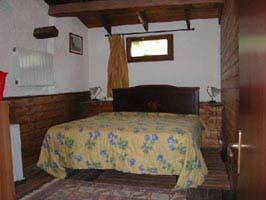 m) with a wide flower-bed and a private barbecue for exclusive use of the guests, comes with patio furniture. "Pauline" 120 sq. mt. (beamed ceiling, floor board upstairs) detached country house that we have just finished to renovate. 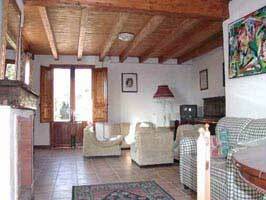 Consists in a large living-room furnished in old style, open fireplace, piano (in tune), HiFi, satellite TV, fully fitted kitchen (micro-wave, blender), bathroom (shower)on the ground floor. Upstairs: small lounge, 2 double bedrooms + 1 bedroom with 2 single beds + 1 bathroom (tub). Independent central heating. 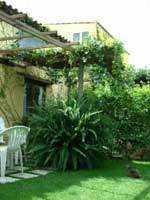 The garden(160 sq.mt) is for exclusive use of guests and comes with patio furniture. Sheltered barbecue. Private car park. All the apartments offer a wide range of modern appliances including central heating, gas cooker, fridge, TV, hair dryer, etc. There is ample parking on site as well as washing facilities. 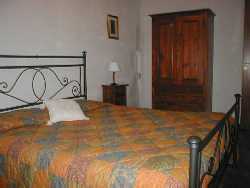 Bed linen, towels, tea cloths are also provided. Washing up liquid, washing powder and softener, toilet rolls etc., are also provided. 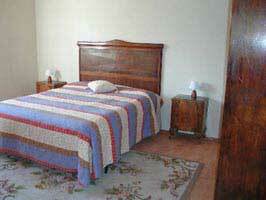 Fresh bed linen and towels are supplied weekly.There is always sufficient extra bed linen available. On arrival, you will find a complimentary bottle of wine to welcome you. Organic olive oil, fresh eggs, and home made marmalade (according to season) offered. Within a two-minute drive you will find restaurants, pubs, banks, supermarkets, post office, hairdressers, cinemas, museum, churches and other visitor attractions. Within a ten-minute drive you will reach the finest beaches (rocks or sand, as you like). There is a bus stop right outside the nursery. There is an abundance of good, reasonably priced eating establishments in the area. These include pizzerias and restaurants. Anything from the plain and reasonably priced, to the more sophisticated palate are catered for. This exceptionally well equipped holiday accommodation is the ideal holiday base at any time of the year, where you are assured a warm welcome. The apartments are let out on a weekly basis only in August, for the rest of the year part time lets are welcome. Arrivals and Departures - Visitors are asked to arrive no earlier than 2:00 p.m. Outgoing visitors are asked to vacate the apartment by 10:30 a.m. to enable us to have the apartment ready for the next occupants. However if no one is coming into the apartment on the day of your departure, you are more than welcome to stay longer. Please ask. 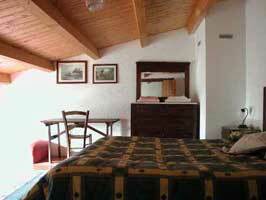 RATES are for the entire accommodation and include taxes. At no extra cost are towels and linen, free parking, washing machine, mountain bikes, Internet access, video games, boarding games and a multi-lingual library. Welcome basket with essentials on arrival: Organic olive oil (our production), tea, coffee, jam, honey, sugar, salt, fruit juice, butter, cheese, eggs and bread). Please note that where possible, in August, bookings must be for a minimum stay of one week. Reservations are not final until a confirmation has been sent. To complete your reservation we require deposit at time of booking. This amount will be deducted from the final bill. cancellation must be made 30 days prior to arrival to avoid cancellation charges. Visa, American Express, Diners Cards accepted.